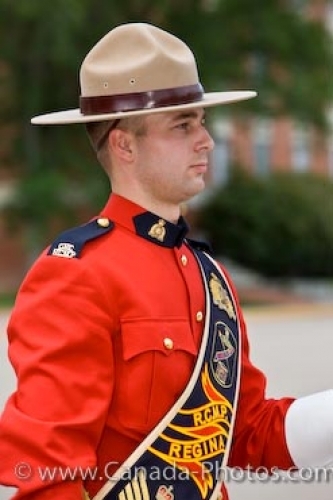 Dressed in the traditional bright red uniform and brown colored stetson hat, a Sergeant of the RCMP leads the band. Performing at the Sargeant Major's Parade and Graduation Ceremony at the RCMP Academy in the City of Regina, Saskatchewan, the band leader has worked hard with his group to teach them songs and signals. Tourists to the RCMP Academy can watch and take pictures of these formal occasions as the band leader marches his troops across the grounds. Members of this musical group have volunteered to be part of this band, led by Sergeant Bob Beaudoin. Procession leader in the Sargeant Major's Parade and Graduation ceremony at the RCMP Academy, City of Regina, Saskatchewan, Canada. Picture of the band leader, Sergeant Bob Beaudoin, at the RCMP Academy in Regina City, Saskatchewan.